Home / Thoughts / This Time is Different? 22 March 2019. The yield curve inverted. Briefly, it could be read as investors are rotating their short-term bond investments (3 months) to long-term ones (10 years), to the extent that they are willing to do so even if it means making a seemingly illogical investment of having lower returns over the long-term, compared to higher returns over the short-term. Now bear in mind these are highly intelligent professional and sophisticated institutional investors – Why would they make such an illogical choice? As the saying goes, one bird in the hand is worth two in the bush. Under normal circumstances, an investor might expect higher returns for long-term investments (lower certainty) and might be willing to accept lower returns for short-term investments (higher certainty). Unless of course, these are no longer normal circumstances, and they are seeing something ahead which we might not see yet, and since these institutional investors have a much larger portfolio, they have to begin rotating now, ahead of the pack. 1) Yield curve inverted for the first time since 2007. Year 1989, the yield curve inverted. The market made a point that this time is different because of some reason. The result was that the US market tanked a year later in July 1990. Year 2000, the yield curve inverted. The market argued this time is different because of some reason. The result was that the dotcom bubble burst months later in March 2001. Late 2005, the yield curve inverted. The market insisted this time is different because of some reason. The result was the subprime mortgage situation melted down 18 months later in October 2007. 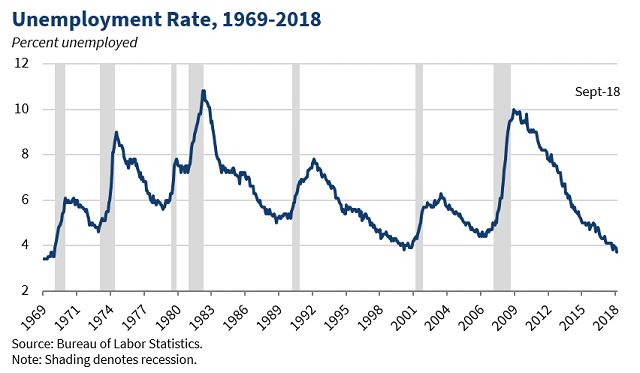 2) America’s unemployment rate is at historical lows. 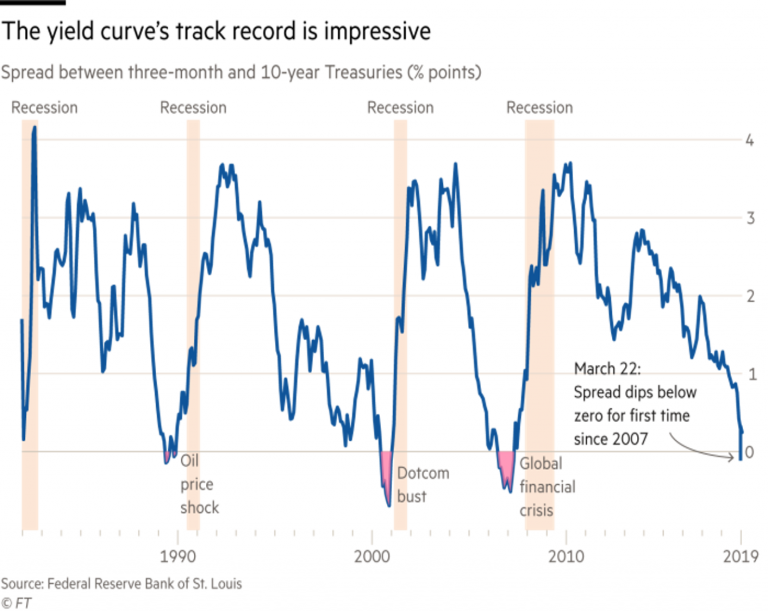 The interesting thing is that when we overlay the US unemployment rate chart with the US yield curve spread, we might see a glaring co-incidence from 1989 – each time 1) the yield curve spread inverted and 2) the unemployment rate goes up subsequently (might be caused by the former), a recession occurred. It’s not exactly rocket science – with yield curve inversion, businesses might find it harder to obtain loans from banks and therefore might slowdown their expansion (spending) and sought to reduce expenses by increasing productivity and hiring less workers. When this occur through the value chain, economic activities might reduce, such is the vicious cycle. 3) A general sense where investors no longer require a sense of caution despite increased negative news; i.e. getting less risk adverse and willing to take more risk. Many if not most companies are generally grossly overvalued. Even some of the high-quality companies we have previously highlighted seem to be in dangerously high valuation ranges. 4) A general on-the-ground observation that many high-quality companies are being shorted at higher than usual levels in at least the past 24 months (even higher count than Sep-Dec 2018). 5) A general sense of hype where any company which claim they are associated with “AI”, “Cannabis”, “Robotics”, “IoT”, “EV”, “5G” and so on might literally increase a few folds in valuation in a few short months, apparently just because. We think this might be a consequence of too much money chasing too little good ideas. More importantly than claiming any financial forecast, we investors should be taking a hard look and ask ourselves if our portfolios are resilient enough to withstand any unintended shocks, and what can we do to mitigate risks while staying invested for further upside? Our approach is a unique blend of Value, Growth and Quality; QGARP, if you will – Quality Growth at Reasonable Prices. We see that there are still some pockets of high-quality companies run by honest management and with growth tailwinds behind them. Equally important, fellow investors should invest in mainly undervalued companies at this late stage – the unintended difference might be a 20% fall or a 90 percent cliff jump. Lastly, we will be mindful to rebalance our portfolio when some investee companies get priced beyond “reasonable valuations” in the coming months. We might in fact hold more cash after said rebalancing.